Firstly, December 21st was the shortest day and longest night. Lots of pagan types descended on Stonehenge as it marks the Winter Solstice. Members of the London Brompton Club descended upon the streets of London. It also had more significance as this date also represented the two year anniversary of the club. 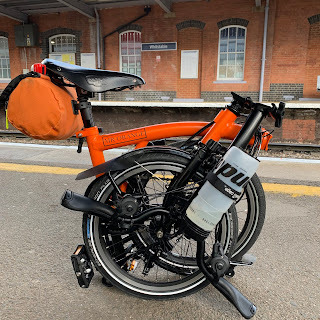 My journey started with meeting the Co-founder Mick and cycling down to Piccadilly Circus to meet the other Co-Founder and my partner in crime, Andrew. We wasted no time in cycling to the meeting point, The Lord Clyde Public House not too far away. All of Saturday the weather was quite terrible and it rained almost all day. In fact it only stopped just after 23:00. After that our entire ride was rain free. The weather was also quite mild for the time of year and certainly a great deal warmer than I remembered for last years outing. Reaching The Lord Clyde I saw lots of familiar faces. Mark (King of the Hill) came to say hello and see us off as he was working the next day and therefore understandably couldn't go. This was a shame but I am sure I'll be able to drag him out soon at some point. There were very few people in the pub but three took a great deal of interest in out bikes and what we were doing. They really were quite charming and the gentleman in the photo reminded me of the actor Ray Winston for some reason? Saying goodbye to Mark we headed off for our solstice adventure. What dramas would unfold? With child-like eagerness I was keen to start this adventure. Much of London was decorated with all manner of Christmas decorations. It looked stunning and I cannot understand why more people weren't out and about? The river Thames - the backdrop for so many of our rides in the past looked beautiful at night and a moon, although no longer full- provided extra illumination. I decided to take my Original Orange Brompton with me tonight. I felt that the more upright riding position would allow to view all London had to offer all the better. The sights came thick and fast and every so often we would stop and take the odd photograph. All of us did this and between us, we probably have enough to fill an album. 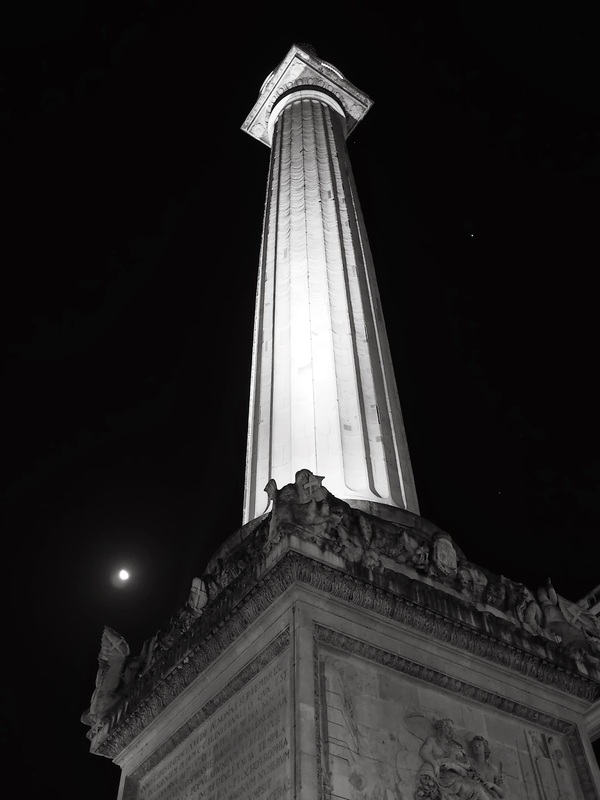 Passing the Monument which marks the spot at which the Great Fire of London stopped, I made a mental note to come back and climb its staircase to the top. Many of us took photos of a bronze statue of a man driving some sheep. This perhaps signifies being afforded the freedom of the City of London. Recipients of this honour usually guide a sheep across London Bridge as holding the freedom of the City allows this perk! At the Bank of England's imposing building I decided to take a photo of the Duke of Wellington statue nearby. I am not entirely sure I have captured the most flattering angle for his Grace's horse?! Near the entrance to the Bank of England there was another statue entitled 'The Hand of God' which provided lots more photo opportunities. While in the heart of the City we payed a visit to the Gherkin - a particular favourite of mine. As we headed out of the City I knew that the next destination would certainly grab my attention - Brick Lane! As you can see by their absence, there are no pictures of Brick Lane...but for good reason. As we cycled along this famous street, now ultra hipster, everything seemed quiet. It looked rather pleasant. That is when it all changed. In the distance a fully grown adult male - who should have known better - worse for wear, lay in the middle of the road. A friend remonstrated with him to get up but the chap lying in the middle of the road was having none of it! Despite several Brompton's and even the odd car, he wouldn't budge. We all passed by and he was still lying there. A feature of London is its nightlife. There are lots of clubs and even at 01:00 in the a.m. many were queuing to get it!! Had I of been driving, a finger would have pushed my central locking to lock. Being on a Brompton, I simply pedalled faster! Heading back to familiar territory the Bloomsbury area was explored. The area seemed very quiet and with the prospect of a cup of tea/coffee in sight, we quickened our pace. Sanctuary came in the form of St Pancreas Station. While sipping on my coffee, Mick retold the tale of how on the last night ride he missed his last train home and had to spend most of the night in the same coffee shop being chatted up by a transvestite. Only in London. With our refreshments consumed we headed south and towards Oxford Street. Oxford Street, perhaps one of the most famous in the world was fairly quiet for this time of year. Kitted out in its Christmas colours, it looked lovely. Brook Street's sparkly arches caught our eye and again provided lots of photo opportunities. 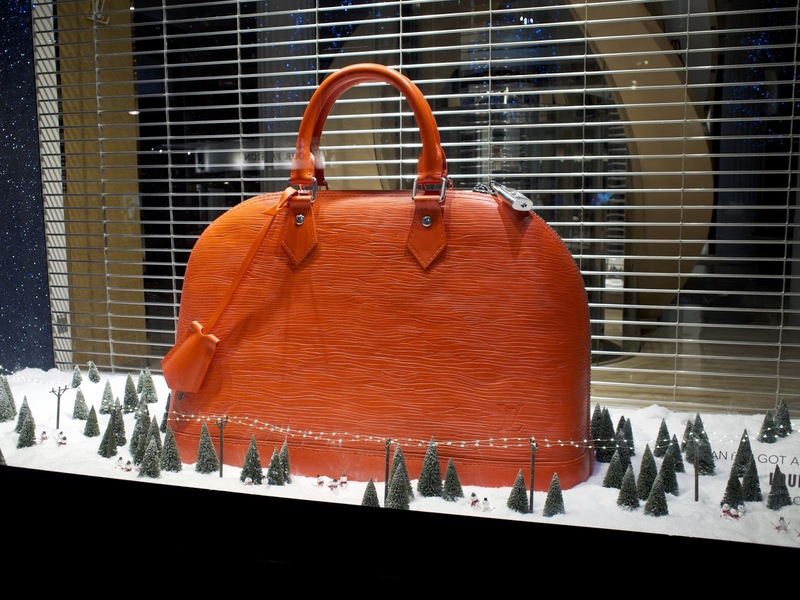 The window display at Selfridges rarely disappoints any time of year but the Christmas display is as innovative as it is famous. 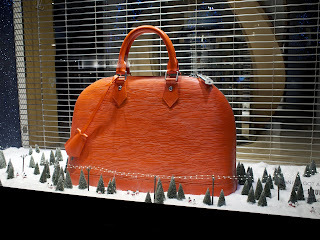 One rather expensive handbag caught my attention for some reason? Just before returning to Piccadilly Circus we cycled down Carnaby Street. I stopped a Dr Marten's shop and saw a pair of rather fetching brogues in an even more fetching colour. Might have to pay them a visit in daylight hours. At Piccadilly Circus the famous Eros statue had been turned into a snow globe. I actually think it is a very clever way of protecting it from vandalism over the Christmas period and much prettier than previous efforts in this regard!! Heading past Trafalgar Square I look up at Admiral Lord Nelson briefly and was to think of him again shortly. Near Covent Garden we passed a white portable structure that I thought was a telephone kiosk of sorts. I write this as I saw a man standing using it. 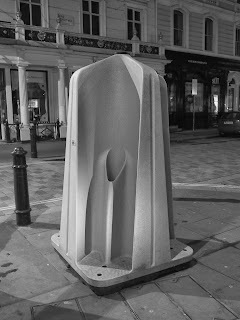 One of my fellow Solstice adventurers broke it to me that this was in fact a portable urinal of all things. My first thought was, in London!? My second thought confirmed I had lead a sheltered life. Another thought, what would Nelson have to say about this? My final thought was that I did not hear this chap shout out 'pain, pain pain' which I believe to be an old bylaw for being allowed to relieve oneself in public in the City of London. I know that this location fell outside the City but I mean really! At Covent Garden one of our number actually used one of these public urinals! I suppose when you have to go! Cycling up The Mall we could see Buckingham Palace. With some of us being caught short as it were, a suitable tree was found and well...nature took its course. When you have to go... I must confess to feeling rather bad about it all as the flag was up on Buckingham Palace and it just seemed wrong on a number of levels. 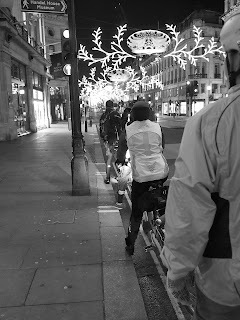 As we reached the bottom of Park Lane, part one of our ride namely the Christmas lights and sights was over. We said goodbye to two of our number and shortly after that a third and the second part of this Solstice adventure began. The idea was simple. Many of us have Garmin GSP devices that record ones route. We were going to ride a route that would plot the initials of the club - LBC on a map of London. It wasn't going to be quick being almost 24 miles. It was the brainchild of navigator extraordinaire and all round good egg David, who not only devised the route but guided us and organised the entire night. The pace was as brisk as it could be as traffic was starting to build. Eventually we heard the end signal on David's Garmin that we had done it. A quick look at the map on our devices and we could see LBC! This was a brilliant ride. The first part was great fun and trying to map put LBC on the anniversary of the club on the Solstice was a great little adventure. Reitring to Kings Cross, the remaining few had something to eat before going our separate ways. A big thank you to all who came on the ride but special thanks to David who has yet again worked so hard to produce an adventure of pure quality.